For two months following her 9 March 1862 battle with CSS Virginia, (see Battle of USS Monitor and CSS Virginia), the Monitor (see USS Monitor: Homepage) was kept at Hampton Roads to keep the Confederate ironclad in check. On two occasions during that time, efforts were made to bring on a battle between the two. The first, on 11 April, was on the initiative of the Southerners, and the Monitor, acting under orders to maintain the status quo, declined action. On 8 May, the Union ironclad, accompanied by other ships, shelled enemy batteries at Sewell's Point in an effort to draw the Virginia out where she could be assaulted. Again, the intended target refused the bait. On the following day, Monitor reconnoitered the batteries and found that they had been abandoned, opening the way for Federal forces to occupy Norfolk. After Virginia's (CSS Virginia (formerly USS Merrimack): Homepage) demise on 11 May, Monitor supported the Army's offensive up the James-York Peninsula toward Richmond. On the 15th, she participated in a bombardment of Confederate fortifications at Drewry's Bluff. These James River batteries, manned in part by crewmen from the late ironclad Virginia, successfully resisted the attack. Monitor's guns were unable to elevate sufficiently to hit the well-situated enemy, USS Galena, her thinly-armored consort, was badly shot up. In early July, Monitor was also present as U.S. Navy gunboats provided gunfire support as General McClellan's army withdrew down the Peninsula after the Battle of Malvern Hill. For the rest of July and August, she served on the blockade in the Hampton Roads area. A combination of torrid sun, black-painted structure, high humidity and insufficient ventilation produced interior temperatures of up to 150 degrees, clearly demonstrating her habitability problems. (Picture) USS Monitor (1862). 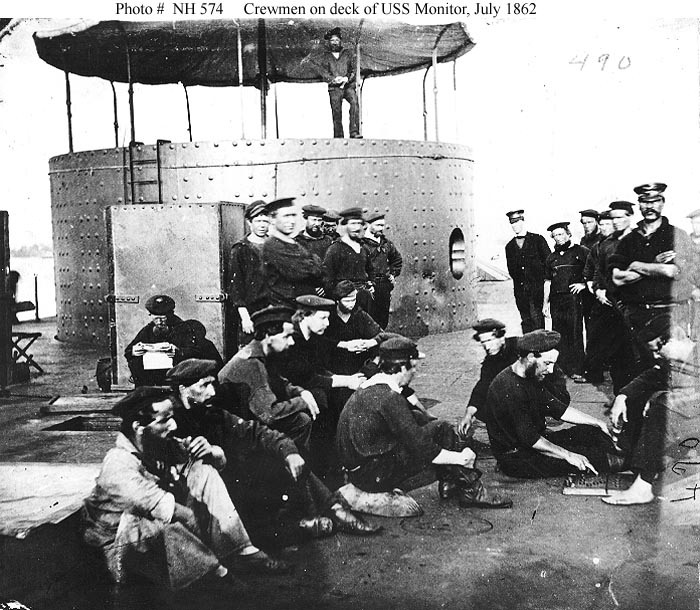 Crewmen relaxing on deck, while the ship was in the James River, Virginia, on 9 July 1862. View looks forward on the starboard side, with the gun turret beyond. Visible are numerous dents on the turret that it sustained while in battle with the CSS Virginia (ex-USS Merrimack) on 9 March 1862, at the Battle of Hampton Roads. Note the men playing checkers at the right. Another man is reading a newspaper by the starboard smokestack. To view the history of the USS Monitor and CSS Virginia, with numerous photographs, artwork and paintings, visit our pages on the links located at the bottom of this page Photo is courtesy U.S. Naval Historical Center. Recommended Reading: Civil War Ironclads: The U.S. Navy and Industrial Mobilization (Johns Hopkins Studies in the History of Technology). Description: "In this impressively researched and broadly conceived study, William Roberts offers the first comprehensive study of one of the most ambitious programs in the history of naval shipbuilding, the Union's ironclad program during the Civil War. Perhaps more importantly, Roberts also provides an invaluable framework for understanding and analyzing military-industrial relations, an insightful commentary on the military acquisition process, and a cautionary tale on the perils of the pursuit of perfection and personal recognition." - Robert Angevine, Journal of Military History "Roberts's study, illuminating on many fronts, is a welcome addition to our understanding of the Union's industrial mobilization during the Civil War and its inadvertent effects on the postwar U.S. Navy." - William M. McBride, Technology and Culture"